The King of Prussia Rail Coalition applauds SEPTA’s Board decision today to approve the Locally Preferred Alternative as presented in the King of Prussia Rail Draft Environmental Impact Statement (Draft EIS) with the North/South design option. This action paves the way for the start of the Final Environmental Impact Statement phase of the project, according to a press release issued by SEPTA. King of Prussia Rail will extend the existing Norristown High Speed Line into King of Prussia, providing a one-seat ride to King of Prussia from either 69th Street Transportation Center in Upper Darby, or Norristown Transportation Center in Norristown. This transformative project will connect the three largest employment centers in the Philadelphia region – Center City, University City and King of Prussia – and will serve as a catalyst for economic development for the entire region. Among its many benefits, King of Prussia Rail will connect employers to a broader pool of employees, reduce commute times and emissions, and spur on job growth. The King of Prussia Rail Coalition seeks to build support from elected officials, employees, commercial property owners, local businesses, residents, visitors, regional economic development and job growth agencies, and chambers of commerce for the proposed extension of SEPTA’s Norristown High Speed Line into King of Prussia. To date, over 650 people and companies have endorsed the project on the Coalition’s website, koprailcoalition.com. Joining Sweeney on the King of Prussia Rail Coalition’s Advisory Committee are Michael G. Anastasio, President of Bala Consulting, Engineers, Inc.; Thomas A. Caramanico, President of McCormick Taylor, Inc.; Bernie Dagenais, President of Main Line Chamber of Commerce; Rev. Peter M. Donohue, President of Villanova University; Pat Eiding, President of Philadelphia Council AFL-CIO; John Fry, President of Drexel University; Gerry Geckle, Vice President of Human Resources at Universal Health Services; William H. Glazer, CEO of Keystone Property Group; Eric Goldstein, Executive Director of King of Prussia District; Rob Henry, Executive Director of GVF; Ira Lubert, President of Lubert-Adler Real Estate Funds; Kevin Mahoney, EVP & Chief Administrative Officer of University of Pennsylvania Health Systems; John L. Walsh, President & CEO of UGI/Amerigas; and Rob Wonderling, President of Greater Philadelphia Chamber of Commerce. The U.S. office market continued to benefit from strong fundamentals going into 2018, despite continued deceleration in net absorption, occupancy and rental rate growth. With robust corporate profits and continued office-using job growth, that trend is expected to hold through the year as the recently approved tax cuts and expected gradual increases in interest rates make U.S. office and other institutional-grade property types an attractive place for investors to park capital and get cash flow. "You're going to like GDP growth over the next few months," CoStar Portfolio Strategy's Hans Nordby said during CoStar's year-end 2017 State of the U.S. Office Market report, co-presented with managing consultant Paul Leonard. "Corporate profit growth is a good story, and if you already think it's strong, look underneath the hood. It's even better." The improved profit growth outlook for the services sector and other industries that drive office demand, along with expected higher GDP growth projected at a very strong 2.5% to 3% in the next few months, should help office job growth hold steady at strong levels for the next few month, Nordby said. The U.S. office vacancy held steady at 10.1% at the end of the fourth quarter 2017, unchanged from the same period a year prior, despite a large amount of new supply and a 20% decline in office net absorption to 65 million square feet for 2017. Meanwhile, the total amount of office property acquired by investors declined about 15% in 2017 from the prior year, largely due to a sharp drop in office trades in New York City and other gateway markets. Despite the declining sales volume, average prices in primary markets continued to rise, prompting investors to fan out into secondary markets such as suburban Phoenix, where Transwestern Investment Group and JDM Partners acquired Marina Heights, State Farm's office campus in Tempe, AZ, for $930 million at $459 per square foot. Signs of a deceleration in office sales and leasing are evident in several office boom markets, however, including Nashville and San Jose in California's Silicon Valley. Developers delivered 2.9 million square feet in Tennessee's Music City and 8.5 million square feet in San Jose as projects started during the height of the current cycle joined office inventory. In a positive sign, the brand-new stock in both markets is already about 80% occupied thanks to strong leasing by health-care tenants and tech companies such as Apple and Google. "We've definitely seen a peak in the office market," Leonard said. "Everywhere across the board, we're starting to see a deceleration." Leonard sees the national office vacancy rate ticking up beginning this year through 2020 as the expected new supply of space finally begins to outpace demand. Another sign of the slowing office market is the continuing decline in the percentage of U.S. submarkets posting occupancy gains. At the beginning of 2016, more than 60% of office submarkets saw occupancy gains, according to CoStar information. A year later, that number has fallen to less than half. Despite speculation about over the last few quarters about a potential bubble in technology stocks and a decline in venture capital funding, tech tenants continued to log huge absorption gains in the office leasing market. Office sharing firm WeWork led all companies with more than 7.5 million square feet of office space leased in 2017, one-third of that total in New York City alone. Amazon and Apple, which each made major announcements last week regarding future office campuses, each leased more than 3 million square feet. Google, Salesforce.com and telecommunications companies AT&T and Verizon also ranked in the top 10 in office leasing last year. Moreover, availability rates for sublease space have fallen over the past few quarters after ticking up in markets such as San Francisco and Houston in 2016 through early last year during a pause in tech's dizzying growth of the previous few years. The largest investment deals of the fourth quarter reflected both the continued health of transaction activity and pricing in core coastal markets as well as rising investor interest in suburban, secondary and even tertiary office markets. Starwood Capital Group paid joint venture partners Brandywine Realty Trust and DRA Advisors, LLC roughly $333 million for a 1.2-million-square-foot office portfolio in Austin. In the Big Apple, SL Green Realty Corp. and RXR Realty acquired One Worldwide Plaza for $840 million, $829/SF, from New York REIT, Inc. In the west, suburban Los Angeles submarkets like Torrance and El Segundo in L.A. County's South Bay are warming up in the wake of the downtown and Westside office boom. Starwood Capital scooped up Pacific Corporate Towers in El Segundo for $605 million, $381/SF, from a JV of Blackrock and General Motors Pension Trust. Multiple factors are propelling the US life-science industry into a strong expansion, giving major research-and-development centers like Philadelphia some opportunities for attractive growth in the real estate that supports R&D. While many US industries are navigating fundamental disruption, the life-sciences industry—which includes pharmaceuticals, biotechnology and medical-device manufacturing—is on a long-term expansion track. The report examines the generators of the industry’s sustained growth, including the aging US population, increases in public and private funding, hefty job gains and robust construction of lab and R&D space. Greater Philadelphia is one of the nation’s traditional life sciences centers, but is also reinventing itself as the industry changes. Between 2001 and 2016, it lost almost one-third of its drug manufacturing employment. This took place mostly in suburban Montgomery and Chester counties, where the bulk of Greater Philadelphia’s life sciences industry has historically clustered along the Route 202 Corridor. Over the same time, Philadelphia’s deep pool of R&D talent has remained stable, but is slowly moving from the suburbs to the city’s growing Philadelphia Navy Yard and to University City. Among the factors that are expanding the life-sciences market are: the nine-year gain in average life expectancy in the US since the 1960s; rapid advances in life-sciences technology; and increases in funding from the National Institutes of Health and venture-capital sources. For example, venture capital investment in the US life-sciences industry now is 53 percent greater than 10 years ago. Analysis found that regions with high concentrations of research and development jobs also saw the highest growth in their overall life-sciences job bases in the past 15 years. That indicates continued strong growth for leading R&D markets such as Boston, the San Francisco Bay Area, San Diego and Raleigh, NC. In contrast, markets with a historical reliance on the pharmaceutical and medicine-manufacturing industries, such as Philadelphia, likely will grow at a slower pace than the R&D markets as they reinvent themselves. 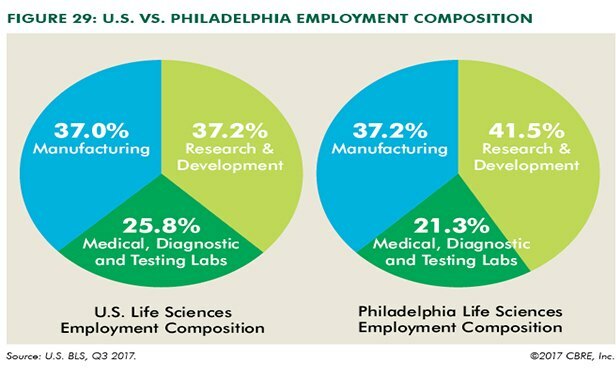 In addition to its deep talent pool, a key factor driving the Philadelphia life sciences industry is its major universities and hospitals. With its accessibility along the Northeast Corridor and its much lower costs compared to New York and Washington, DC, Philadelphia is a very attractive location for life sciences companies. However, a relative lack of capital availability remains an impediment to stronger growth for the industry in the region. Aside from significant funding from NIH, the region lacks sufficient access to venture capital for some emerging companies to stay there. Still, remarkable achievements and ground-breaking research are being conducted in Philadelphia, particularly in gene therapy. Recent developments demonstrating the momentum of the region’s life sciences industry include the rapid expansion of Spark Therapeutics, plans by China-based pharma firm KPB Biosciences for a Philadelphia-area headquarters, and a $100 million investment in University City-based Tmunity Therapeutics. A local investor has acquired the office building at 2301 Renaissance Blvd. in King of Prussia, PA for $47 million, or about $248 per square foot, from Liberty Property Trust (LPT). The seller delivered the five-story, 190,000-square-foot property in 2002 to 15.6 acres in Montgomery County, within the 200-acre Renaissance Business Park and near downtown Conshohocken, Radnor, the King of Prussia Mall, Center City and Philadelphia International Airport. The asset currently serves as Vertex, Inc.’s international headquarters. Prologis Inc. (NYSE:PLD), expects to wrap up several asset sales of industrial property, much of which it acquired in the purchase of the AMB Property Corp. and its 1,130 industrial buildings totaling 142 million rentable square feet seven years ago. Leading off its traditional position as one of the first REITs to report quarterly earnings, Prologis this week announced it plans to continue to capitalize on the extraordinary investor demand for warehouse/distribution property by selling another $1.6 billion in assets in 2018 and recycle the proceeds into new development. A bit surprisingly, that disposition strategy will keep Prologis operating counter to other public REITs in the industrial property sector. Last year, public REITs were net buyers of industrial properties purchasing about 110 million square feet of properties for about for $14.8 billion, according to CoStar data. They sold about 66 million square feet for $6.5 billion. Prologis' share of the activity included buying about 4.1 million square feet in the U.S. for $466.2 million, while selling 16.7 million square feet for $1.2 billion, according to the company. "Just to put everything in context, we sold $11.6 billion of real estate since the merger (with AMB)," Tom Olinger, CFO of Prologis told analysts this week. "I think that represents a couple of companies added in our sector. So we have been very deliberate and active in the dispositions market, probably more than anybody in the business." Bottom line, Olinger said, Prologis has sold 88% of what it wanted to sell, and has done it faster than it projected, thanks to ongoing investor demand for the sector and continued leasing demand in the markets in which it operates. Prologis has been deploying capital from those sales back into development. Last year, the REIT started construction on 11.8 million square of new development in the U.S. valued at more than $1 billion. This year, it expects to complete another 10.1 million square feet in the U.S. valued at $990 million. Some of that new distribution space could end up being on behalf of Prologis' largest tenant: Amazon, which leases more than 16.6 million square feet from the REIT and accounts for 3% of its net effective rent. In its quarterly conference call, analysts asked Prologis executives about Amazon's plans. The dominant online retailer is said to have 30 to 35 build-to-suit warehouse specs out in the marketplace for a new prototype. The warehouses would have a much smaller footprint, measuring from 100,000 to 200,000 square feet, but much higher at 75-foot heights, and multi-story. "Amazon has pretty much got the same strategy we do. They want to be near where the consumers are," Hamid Moghadam, chairman and CEO of Prologis said. But, Moghadam added, knowing the right strategy is one thing. Finding the available land to support it is another. "Look, it's kind of getting harder and harder to find large plots of land that support single story, 800 million-square-foot type buildings in these urban areas," said the Prologis CEO. "So they need to be able to squeeze that much business into a smaller footprint by going vertical. And even in the 800 million-square-foot, they mezzanine them at three levels. So operating multiple levels with low clear heights are not anything unusual for them by any stretch." "Any building that we do for Amazon, or for anybody else, we go through the same analysis," Moghadam added. "Do we want to own this building in a soft leasing market without Amazon renewing? And if the answer to that is that the building is fungible and divisible and we can lease it to a normal tenant, we keep it." Demand for distribution space is also coming from other customer segments, including transportation, construction, food and auto, Moghadam said. And e-commerce as a percentage of the demand has also been fairly steady. There are several others in the e-commerce sector besides Amazon who have big plans for new distribution rollouts this year, he added. Equity Commonwealth (NYSE: EQC) has entered a definitive contract to sell the PNC Bank Building at 1600 Market St. in Philadelphia, PA, continuing the firm's massive sell-off of its U.S. portfolio. Subject to customary closing conditions and extensions, Equity expects the sale to close by Feb. 28 for $160 million, or approximately $194 per square foot. Proceeds from the sale, after credits and capital costs, contractual lease costs and rent abatements, are expected to net the firm approximately $156 million, according to a corporate release. Local media outlets are reporting the buyer of the asset is Herndon, VA-based American Real Estate Partners. Constructed in 1980 with a renovation completed in 1997, the 39-story, 825,968-square-foot, 4-Star office tower is located on eight-tenths of an acre in the Market Street West submarket of Philadelphia. The Energy Star-rated building offers numerous features including on-site banking, food service and management. It is currently 84 percent leased to a mix of tenants including PNC - Underwriting, Schnader Harrison Segal & Lewis LLP and McCarter & English LLP. Equity Commonwealth, the Chicago-based, self-advised commercial office REIT led by American billionaire businessman Sam Zell and CEO David Helfand, sold almost $107 million worth of assets during the fourth quarter of 2017, including: a 15-building, 1.18 million-square-foot office portfolio in Moon Twp. and Pittsburgh for $71 million; the fully-leased, 131,000-square-foot building at 789 E. Eisenhower Pky in Ann Arbor, MI for $24.9 million; and a 175,000-square-foot industrial property at 33 Stiles Ln. in North Haven, CT for $10.5 million. After going under contract on the PNC Bank Bldg. in December, Equity Commonwealth went under contract this month to sell the 1.57 million-square-foot office tower at 600 W. Chicago Ave. in Chicago, IL. Currently 98 percent leased and anchored by Groupon's world headquarters, the property is expected to close in March for a gross purchase price for $510 million. With the completion of its two pending deals, Equity Commonwealth will have grossed roughly $775 million in proceeds over the last two quarters. A cold, windy day didn't stop crews from working on their latest venture within 'New Ventures Park' in Blakeslee. They're building a one-million square-foot distribution center for American Tire Distributors, a North Carolina-based company serving the United States and Canada. It's expected to open this October. Henry Steinberg is with the development group leading the $70 million dollar project. "So they bring the tires into the warehouse, re-sort them based on customer orders, send them out to regional, smaller distribution facilities which then go out to the places where the everyday consumer buys their tires," explains Henry Steinberg, Exeter Property Group. This creates 80 permanent jobs in management and warehouse operations, plus 120 construction jobs. "What that is, we're not only creating jobs here in Tobyhanna Township, but creating a quality of life that helps stimulate the job creation," says John Jablowski, Tobyhanna Township Manager. The project's happening next to another new project; a travel plaza right off Interstate 80. Jablowski adds, "and we have a lot of plans on the drawing board to continue that growth here." State Representative Jack Rader says new development helps keep unemployment numbers down, locally. "I want to spur economic development, spur job creation, good jobs. And try to get more jobs in the area, and that's what we're trying to do here," says State Representative Jack Rader, 176th District. There's no word yet when American Tire Distributors will begin taking applications, or how much the jobs will pay. Westrum Development Company completed the revitalization and official integration of 770 Sandy Street into the luxury apartment campus of its Luxor Lifestyle Apartments. For more than a decade before Westrum Development Company took ownership, the property at 770 Sandy Street was embroiled in construction, legal, and financial turmoil that cost Norristown taxpayers up to $4 million for repairs, and legal expenses. The completed renovation promotes continued economic growth for Norristown. The residents at Luxor Building ll have full access to the amenity-rich, technologically advanced, and socially integrated main building, Luxor Main, next door with an open air courtyard with bocce, grilling and firepits, an infinity pool, a BYOB bar, fitness center and panoramic views of Norristown and Philadelphia’s skyline. Albertsons LLC, an affiliate of the parent company of ACME Markets, sold a strip center that included an ACME store at 7010 Germantown Avenue, for slightly more than $5.9 million, or about $152 per square foot, to a joint venture of Fortress Capital Investors and Cardinal Capital Investors then leased back the property as part of a 69-property portfolio across the country. Main Line Health has renewed its lease for 100,462 square feet in the Keystone Executive Center office building at 240 Radnor Chester Rd. in Radnor, PA. The tenant occupies the entire two-story building. It was built in 1955 on 7.2 acres in the Upper Main Line submarket of Delaware County, and was renovated in 2009. Distribution company Uline acquired two adjacent build-to-suit distribution buildings on Mill Creek Rd. in Wescosville, PA and a nearby land site on W. Grange Rd. in Allentown, PA for $249.05 million from Liberty Property Trust (LPT). Totaling 1.67 million square feet, the two buildings had been a built-to-suit for Uline in LPT’s Liberty Business Center III, straddling Lower and Upper Muncungie that delivered in December 2016. The transaction represents the largest industrial sale in Lehigh County for 2017, according to CoStar data, and was the result of Uline exercising an option within their lease with LPT. In August 2017, a representative for the company noted at the time that the pending deal demonstrated Uline’s commitment to the Lehigh Valley, where the Prairie View, WI-based company has had a presence for more than a decade. Continuing to reposition its portfolio, Malvern, PA-based Liberty Property Trust sold a portfolio of 14 office and flex buildings in the Renaissance Park Corporate Center in King of Prussia to MLP Ventures for $76.9 million, approximately $120.08 per square foot. The portfolio consists of eight office properties totaling 357,705 square feet and six industrial/flex properties totaling 283,620 square feet located along Horizon Dr. and Renaissance Blvd. totaling approximately 641,000 square feet. The portfolio had an 87% occupancy rate at the time of sale. The buyer, MLP Ventures, is a privately owned real estate development company previously named O’Neill Property Group. Founded in 1988 by J. Brian O’Neill, the firm is controlled by three Philadelphia-based real estate investors and focuses on acquiring and converting underutilized industrial facilities into functional commercial or multifamily space. 700 and 800 Uline Way, a pair of industrial properties totaling 1,683,876 square feet on 44 acres in Allentown, PA for $249.1 million. 2301 Renaissance Blvd., a 189,502-square-foot office building in King of Prussia for $47 million. 1221 North Alder Ave., a 702,668-square-foot warehouse property in Rialto, CA for $94.2 million. One Truman Dr. South, a fully leased, 369,313-square-foot industrial property in Edison, NJ for $48.9 million. 16325 South Avalon Blvd., a fully leased 210,710-square-foot industrial property in Gardena, CA for $46.4 million. Billionaire real estate investor Sam Zell on the economy, tax reform and investing globally from CNBC. A strong commitment to local expansion from one of the city’s marquee companies is cementing the credibility of Philadelphia as a realistic choice for businesses and other organizations considering relocation, according to the heavyweight panelists at last week’s CEO & Leadership Symposium hosted by the Jewish Federation of Philadelphia at the Ballroom at the Ben in Center City. The Philadelphia real estate market has transformed over the past decade from one with stagnant property values, lackluster sales of condominiums, and slow growth in retail and offices. Dranoff’s firm just completed leasing for One Riverside, 68 condominiums in a 22-story building adjacent to the Schulykill River. Philadelphia and other cities are still challenged to provide “workforce housing” for residents who can’t afford to live in market-rate luxury buildings, Dranoff says. “That’s a complicated subject,” he says. “It hasn’t really been solved in any city across America so far.” Cities have tried direct subsidies, contributions from nonprofits and quasi-government agencies, “fix-up” programs in the neighborhoods including grants for repairs of older housing stock, he says. “There has not been a highly successful model that I know of that we can say, ‘that’s the one I want to borrow,’” he says. Brad Korman, co-CEO of Korman Communities, who moderated the program, says business travelers who make longer visits to cities like Philadelphia are looking for different kinds of lodging. In the “extended stay” sector of the hospitality sector, people prefer a condominium style apartment for two or three months, rather than a hotel room, he says. Increased homelessness and streets that are too narrow for modern traffic are challenges the city faces in putting its best foot forward with visitors, says Meryl Levitz, president and CEO of VISIT Philadelphia. The transformation of West Philadelphia, once regarded as an urban blight, into what is now called University City doesn’t surprise Dranoff. As office space requirements and design needs continue to evolve to accommodate technology demands, Comcast Corporation expects to be delivering new options to its corporate clients, according to David Cohen, senior executive vice president with the cable and media giant. Comcast is about to open its second skyscraper in Philadelphia, the Comcast Technology Center, and as Cohen says, “It’s a building that has 1.3 million square feet of office space and no offices. It is that ultimate open footprint with collaborative workspaces. It’s a vertical technology campus, and the way we designed it is we talked to our engineers, our software developers, our app developers, and asked ‘what do you want in a workspace?’” The building will be equipped with state-of-the-art multigigabit Internet access. Comcast’s decision to expand in Philadelphia was important from a business legitimacy perspective, says VISIT Philadelphia’s Levitz. “The jobs and opportunities that it provides are numerous and of the scope that we need here in Philly,” she says. From a travel and tourism perspective, Levitz says the city’s “walkability” is a big plus for companies considering bringing employees here. Korman and Jacob Reiter, president and CEO of Verde Capital, a private equity investment firm, co-hosted the program under the auspices of Jewish Federation Real Estate, an affinity group for participants in the commercial real estate sector in the Philadelphia region. “We wanted to bring the freshest minds that were leading and adapting to change, that were leading organizations that were visionary,” says Reiter. The JFRE group also raises money for nonprofits dealing with hunger, physical and emotional disabilities, and at-risk families in the Delaware Valley and in Israel, says Reiter. About $3 million dollars has been raised and distributed in the past three years, he says. UPenn Medicine - Center for Healthcare Technology has signed a lease for 30,000 square feet in the in-development office building rising at 3600 Civic Center Blvd. in Philadelphia, PA. The 18-story building is currently under construction and expected to deliver in January 2020. It will total 540,000 square feet and broke ground in May 2017. It is owned by the Trustees of University of Pennsylvania. UPenn’s lease includes the first floor of the building. Jefferson Apartment Group is breaking ground this month on Jefferson Place Mt. Laurel, a 490-unit multifamily building located on Union Mill Rd. in Mount Laurel, NJ. When it delivers in early 2019, the apartment project will span 21 garden-style buildings in the Lower Burlington County Multifamily submarket. Amenities will include a clubhouse, swimming pool, fire pits, gym, cyber lounge and pub room. Jefferson Apartment Group owns and is developing the property, and will manage the property as well. Companies now view real estate as motivational for workers: JLL from CNBC. First Industrial Realty Trust has broken ground on the First Logistics Center - Bldg. A, a 738,720-square-foot industrial warehouse in the Lebanon Industrial submarket of Philadelphia. The facility is located at 112 Bordnersville Rd. in Jonestown, PA and will have 135 loading docks and four drive-in bays. The property is expected to complete in the fourth quarter of 2018. A surge in fourth quarter activity pushed 2017 industrial leasing to 44.8 million square feet—the third consecutive year annual total leasing activity surpassed 40.0 million square feet. Following a summer slowdown, industrial tenants leased 13.9 million square feet during the final three months of the year, representing a 52.8 percent jump quarter-over-quarter. A nearly 1.4 million-square-foot lease renewal by Williams Sonoma at 340 Middlesex Center Blvd. in South Brunswick led the pack, followed by a 725,400-square-foot pre-lease by Best Buy at 171 River Road in Piscataway and a 597,594-square-foot new lease by Amazon at 18 Applegate Drive in Robbinsville. The average asking rent continues to rise as well, reaching a record high of $7.23 per square foot – up from $6.43 at year-end 2016. Northern New Jersey maintained healthy industrial momentum, with 5.5 million square feet of leasing, its sixteenth quarter of positive absorption and an all-time low availability rate of seven percent. Central New Jersey recorded 8.4 million square feet of industrial leasing activity in the fourth quarter, bringing the region’s 2017 total to 27.1 million square feet – the second-highest annual total on record. 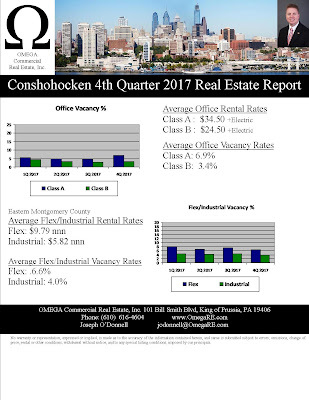 On the office side of the market, a slowdown in North Jersey leasing activity during the fourth quarter, coupled with new availabilities, resulted in negative net absorption for the quarter. While the availability rate improved 40 basis points from the prior quarter, to 20.5 percent, this was a result of the ongoing adaptive reuse trend and not an increase in tenant occupancy. The lack of demand from larger office tenants in Central New Jersey pushed leasing activity down to levels not seen since 2014, and the availability rate remained unchanged, hovering around 19.0 percent for the third consecutive quarter. Significant office tenant commitments offered bright spots, including Societe Generale’s 108,574-square-foot lease at 480 Washington Blvd. in Jersey City, and Movado Group’s 90,050-square-foot lease at 650 From Road in Paramus. Altice USA made two notable commitments – 64,125 square feet at 30 Knightsbridge Road in Piscataway and 60,994 square feet at 40 Potash Road in Oakland. “Additionally, several large transactions are anticipated to close during the first quarter of 2018, which will help the new year get off to a strong start." Katz Properties, a real estate investment, development and management company, acquired the Richland Marketplace shopping center at 600-690 N. West End Blvd. in Quakertown, PA for $47.2 million, or about $177 per square foot, from Kimco Realty Corporation and Canada Pension Plan Investment Board (CPPIB). The 266,565-square-foot retail center delivered in 2008. Tenants include Best Buy, Petsmart, Five Below and more. HomeSense, a home décor retailer, has signed a lease for 22,710 square feet in the Fairfield Place shopping center at 123 Swedesford Rd. in Exton, PA. The shopping center totals 335,864 square feet and was built in 1990. It was developed by the Eisenberg Company and is currently owned by R.J. Waters & Associates, Inc. Other tenants there include Giant, Ross, Staples, T.J Maxx and Toys R Us. Joe Waters of R.J. Waters handled the direct lease negotiations in-house. Bart Blatstein’s Tower Investments has sold half of a parcel that the real estate company owns fronting the Delaware River at 1401 S. Columbus Blvd. in Philadelphia to a local residential developer. U.S. Construction Inc. bought eight acres of the 16-acre property with plans to develop the residential portion of a proposed mixed-use project. The sale was north of $20 million. A representative from U.S. Construction, which is based in Philadelphia, couldn’t immediately be reached for comment. Blatstein has been working for the last couple of years on a plan for the site, which is where Foxwoods Resort Casino had once hoped to build a project though those plans never materialized. In 2014, Blatstein bought the parcel that is bound by Reed and Tasker streets, South Columbus Boulevard and the Delaware River. In dangling the prospect of investing billions of dollars in the community and adding tens of thousands of high-paying jobs, online retail giant Amazon kicked off a mad scramble among jurisdictions in September after the firm issued an RFP for a new co-headquarters. Debates over which locations best suited the online retailer's mega-office requirement consumed the CRE industry, and will likely continue to do so ahead of Amazon's site selection, which is expected sometime this year. More than a year in the works, Newmark Group, Inc. (Nasdaq: NMRK) completed its initial public offering of 20 million shares of common stock, the first IPO for a real estate services firm in many years. Howard Lutnick, chairman and chief executive of Newmark Knight Frank parent company BGC Partners, Inc., (Nasdaq: BGCP), made good on his plans to spin-off Newmark as a separate publicly traded company in the fourth quarter. The move added to market speculation that Cushman & Wakefield may follow with an IPO of its own in 2018. Much of the nation was fixated in August on the impact of a pair of hurricanes that ravaged much of Florida and the Texas-Louisiana region. And while the extent of the devastation wasn't as great as first feared, initial combined damage estimates foresaw $29 Billion in commercial property losses with $150 billion to $200 billion in economic impact attributed to the back-to-back natural disasters. #4 Too Much Apartment Construction, or Not Enough? In a midyear multifamily update, we examined recent market analysis that found U.S. housing supply remains well below long-term market averages even as developers continue to pursue new downtown apt. projects and single-family homebuilding finally ramps up. The news that Amazon was buying Whole Foods caught many retail observers by surprise and rattled already jittery shopping center owners. But the deal catapulting the world's biggest e-tailer into the leading ranks of the U.S. grocery industry was quickly reappraised as proof of the ongoing integration of online and physical retail stores, and that well-located retail property will continue to have value as e-commerce continues its rapid growth. Fast-developing driving technologies are expected to usher in a $7 Trillion 'Passenger Economy' by 2050 according to some futurists. The expected wide-ranging impact on real estate expected to affect everything from recapturing parking space, to amenities to zoning, and is already beginning to have an impact on the market. In a surprising move, Paris-based Unibail Rodamco agreed to acquire shopping mall owner Westfield Corp. for almost $16 billion. The decision by Unibail, which gives it entry into the U.S. market, followed news that General Growth Properties Inc. (GGP) had recently rejected a takeover bid from Brookfield Property Partners, which has a large minority stake in the company. Given Unibail's deal, we may not have heard the end of a GGP-Brookfield tie-up. CoStar News was one of the first to report on plans by national CRE services firm NKF to beef-up its valuation and appraisal business lines ahead of its expected IPO later in the year. NKF wasn't alone in its quest to expand its valuation platform. In a sign of the continued strong appeal of multifamily property for investors, apartment REIT Monogram Residential Trust, Inc. (NYSE: MORE) accepted a buyout offer from a newly formed perpetual life fund, Greystar Growth and Income Fund, led by Greystar Real Estate Partners in a transaction valued at $3 billion, including debt. In another sign of the sector attracting 'big money,' Starwood struck a deal to buy out Milestone Apartments REIT for $2.85 billion, adding 24,000 apt. units to Starwood Capital's portfolio. In August, CoStar News reported that the State Council of the People's Republic of China officially announced measures to curb outbound investment - a move Chinese officials had been hinting at all year. The clampdown was expected to impact deal pricing for major assets in the largest gateway markets, which had become a favorite target for Chinese investors. However, market analysts see plenty of other investors--both foreign and domestic--available to fill the gap. The clampdown on Chinese overseas investment followed news earlier in the year that some members of Congress had become concerned over the national security risk associated with the growing Chinese ownership of U.S. assets. Dollar stores remained a retail success story in 2017, continuing to defy online disruption by expanding into untapped, low-density areas to minimize the online threat and drive sales growth. The blockbuster deal of CVS Health (NYSE: CVS) agreeing to acquire Aetna Inc. (NYSE: AET) for $77 billion has the potential not only to fundamentally alter the health plan market but also radically reshape the retail and health care real estate markets. #13 Institutional Investors Coming Around to Student Housing, Sector Seen as Recession-Resistant Alternative to Apts. In a midyear change from focusing on exposure to construction and development and multifamily lending, bank executives and analysts refocused on a new topic this past quarter: addressing perceptions of retail weakness in their real estate lending. The shift in focus followed a drop in CRE lending growth by banks in the first quarter to its slowest level in two years.